Modern freestanding 3 x 2 Villa in quiet complex only 300m to foreshore and the old bridge. Self contained 3 bedroom, 2 bathroom home which comfortably sleeps up to 9 people (max 6 adults). Single garage and space for small boat or trailer is available with an additional car park available in drive. Fully functioning kitchen, and the outdoor entertainment area seats 8 with a BBQ supplied*. Dining facilities seat 10 people. Families are catered for with a collection of DVDs, playstation, games, books and colouring pencils available. The master queensize bedroom has a TV and DVD player and an ensuite with toilet and shower. The double bedroom has a double bunk with single on top. The bunk room has 4 single beds. All bedrooms have wardrobe space and the property is airconditioned with a split system for comfort throughout the year. Three night stay required for long weekends. The property is not suitable for pets and smoking is permitted outside in the rear courtyard. Please note - a maximum of 2 vehicles per stay due to parking regulations. *Gas bottle provided - gas use and refills at discretion of tennants. Linen is included in price - bedding and bath towels. Beach towels not supplied. Minimum 2 night stay during low and shoulder season. Minimum 3 night stay during long weekends and peak season. Base rates are calculated for up to 4 adults. Additional guests $30p/n (maximum 6 adults). 2 bathrooms with showers, 2 toilets (one in ensuite). Owners did not provide access information until after check in time! Was unable to contact or did not receive reply for 24 hours by phone, email or APP. Property was fine a few spiders and cobwebs, damaged blinds and bins were full of stinking rubbish. I found this surprising given were charged for cleaning should have cleaned after last tenant before our visit as part of this fee. Good location. Garage was very small would not fit our SUV in so had to park outside. The bed in the back bedroom is broken and very uncomfortable and it needs a good clean. This property ticked all the boxes for our needs over the weekend. Centrally located, modern and comfortable, it had everything we needed. The kitchen was well stocked with appliances and utensils, the beds were comfortable, as was the living room. A pleasant stay for us all. We were mature adults and enjoyed our stay. Large living area and kitchen. Good sized main bedroom and ensuit. Other 2 bedrooms were very small. Good bench space in both bathrooms. Showers only which was good. 2 TV's. Didn't need to use outside area but was spacious and under cover. No ceiling fans but one large Aircon. in living area. Very quiet, private complex. Car is necessary but everything easy to drive to. Small car would be ideal as we had a family car which could not fit in the parking area or secure garage which was a small problem for us. Very well priced for what you get. Owners were easy to contact. Would recommend this accommodation. We enjoyed our stay, Central location. Kitchen neat and clean, spacious for cooking. Great spot, close to foreshore, coffee strip. 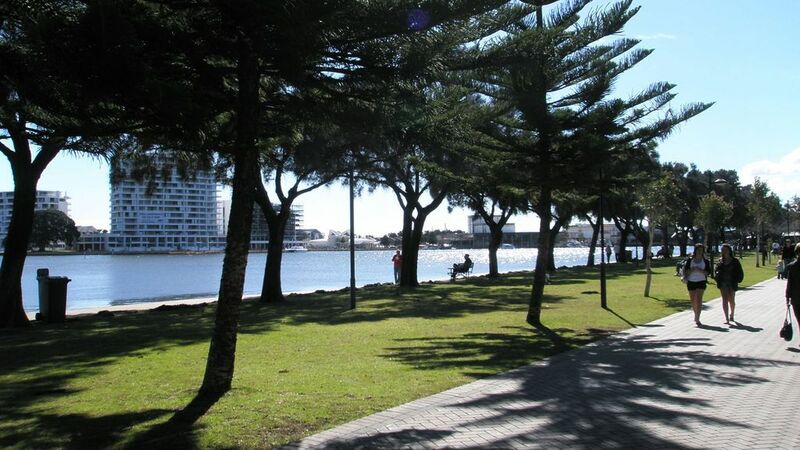 Great property, plenty of space and activities for kids, short walk to foreshore.